Ensuring that employees can collect the paychecks they earn is all in a day’s work for Vicki Lipnic at the U.S. Department of Labor. Lipnic—along with the four thousand employees in the division she leads—administers and enforces the laws and regulations governing areas such as minimum wage, overtime, child labor, family and medical leave, and workers’ compensation benefits. Under Lipnic’s direction the Department of Labor updated thirty-five-year- old rules on overtime pay in 2004, an effort that involved painstaking work and compromise. “It had been tried a couple of times in other administrations,” she explains, “and for whatever reasons—probably because of the controversy that came with it—it wasn’t accomplished.” Lipnic also spearheaded the strengthening of regulations that require labor unions to disclose to members how their dues are spent. And in June she released what is considered to be the seminal report on the Family and Medical Leave Act of 1993. More than five years of experience with the Secretary of Commerce, as well as six years as in-house counsel to the U.S. Postal Service on employment issues, prepared Lipnic for heading the Department of Labor’s largest agency. 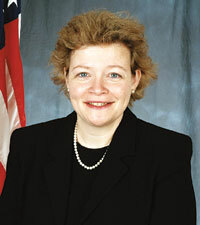 Just prior to her appointment as assistant secretary, she served as workforce policy counsel to a major committee in the U.S. House of Representatives. A career in public service seemed destined for Lipnic. Her mother and father—who was a World War II veteran and longtime mayor of Carrolltown, Pennsylvania—instilled in her the importance of being an involved citizen. At Allegheny she majored in political science and history and interned in Washington, D.C. Lipnic also points to experiences in Kappa Kappa Gamma, student government, and the Campus as key to developing her leadership skills.